I've had both and the hands down winner is the true track. I had originally ordered a true track and got a alloy art txr sent instead. . The txr caused alot of extra vibration and I was quite nervous of it bottoming out on speed bumps because it hung quite low. I told my supplier I wasn't happy and ended up getting a true track. As soon as the true track was installed I lost the extra vibes and it handled alot better than the txr. You will find people that have one or the other for stabilizers, but I've had both and for the few extra bucks it's a far better product that made a huge difference in the stability of my bike. What separates True-Track from the other stabilizers on the market? True-Track is the pioneer of the rear suspension stabilizer to control rearsteer™ with 15+ years of R & D experience. Several imitation units are mounted to one upright on the frame. This causes uneven control in left and right maneuvering. There is visual flex at this point and this attachment can not stop the transmission from twisting when cresting a hill and landing. This can cause the swing arm pivot boss to crack. 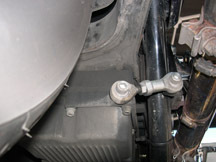 True-Track is attached with 5 bolts which acts as a girdle to reinforce the pan rail and prevent twisting. It puts the load evenly across the frame for maximum control and frame strengthening. True-Track had already tested but did not provide maximum stability nor rider control. Our high engineering standards are in the interest of safety and longevity of a product, not just a cheap temporary fix. Most of the imitation devices have a minimum 45 minute installation process – True-Track on the other hand has a dog bone and a bucket and takes only 15 minutes to install. The maximum ground clearance loss is an 1/8th of an inch and zero lean angle loss though you may have read otherwise by imitators. True-Track continues to provide excellence in accordance with customer feedback and our engineering expertise. True-Track was designed and engineered in America . 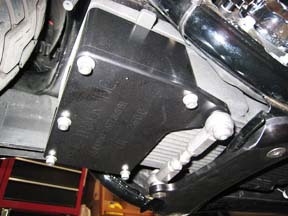 Our material is CNC machined 6061 T6 billet aluminum, made in America. We make our own stainless steel heim joints, vibration isolated and USA made. We do not use steel produced in China and sold at the local hardware store. True-Track orders ship daily worldwide with USPS Priority mail. Free domestic shipping is no longer available. Please enter zip code to calculate cost at checkout. True-Track is designed to be installed by the average mechanic minded person. No jacks or lifts are required. Instructions and tech install picture by picture instructions are all available on the website. True-Track is an innovative company looking out for the safety of fellow riders. With your help we can bring attention and knowledge to the many rubber mounted Harley riders and keep them upright and safe!! !